Buy 1 oz 2014 AG-47 Copper Rounds | ?? 1盎司2014年AG-47铜圆 This copper round is is same as the original silver AG-47 round, changed to reflect the use of copper and the new Silver Shield logo. 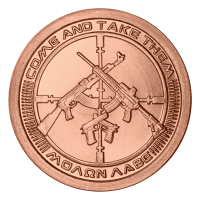 The original design focused on the truth of the right to defend oneself being inextricably linked to freedom and the phrase "Molon Labe - (or "Come and Take Them" in English) captured that idea perfectly. This limited re-release of the original 7th release in the Silver Bullet Silver Shield series is sure to be a popular favourite.